Abu Dhabi Crown Prince Mohamed bin Zayed announced a new social support program for citizens in the emirate to double the number of the government's annual subsidized housing loans. On June 4, Abu Dhabi Crown Prince Mohammed bin Zayed al-Nahyan announced a new social support program for citizens in the emirate to double the number of the government’s annual subsidized housing loans. 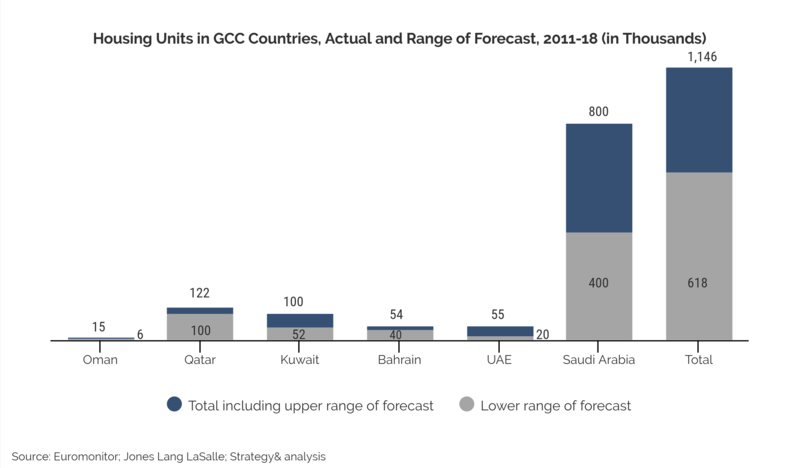 There is a broad trend in the Gulf Arab states to whittle down subsidies and chip away at public sector wage bills, but the reality is that states are continuing to spend in large fiscal outlays. They are targeting spending, notably in grand development plans, while also trying to create new revenue streams from citizens, residents, and the private sector. The choices of where to cut government spending (and how to anticipate both economic and political reactions to those cuts) have become vital to a new experimental style of public policymaking in the Gulf. As governments in the region compete to make their business environments more welcoming to foreign investors, they are weakening one of the key tools of wealth redistribution utilized over the past 40 years, the commercial agency structures that required local partnerships for the establishment of franchises and foreign-owned firms. As the wave of economic liberalization continues to spread across the region, opening paths to greater ownership stakes for foreign investors, allowing longer term residency permits untethered to employers, breaking down state subsidies on energy, fuel, and water, slimming down public sector wage bills, and introducing consumption and “sin” taxes, there remain few benefits deemed too sensitive to withhold. Housing is perhaps the most sensitive of these social benefits and remains one of the key levers of domestic policy for Gulf monarchies. Despite massive real estate development and the construction of new cities and urban commercial landscapes, affordable housing remains a critical problem across the Gulf states, particularly for low- and middle-income citizens. A shortage of affordable housing is a global issue, but it is especially acute in the Gulf states. McKinsey Global Institute estimates that worldwide some 330 million households live in substandard accommodations or are paying more than 30 percent of their incomes in housing expenses. In the Gulf states, a number of factors have escalated the housing shortage and made housing less accessible for citizens, including: rapid population growth, a rising cost of living, lifestyle expectations in a culture of wealth, and an entrenched system of elite land ownership and state-led megaproject development that has excluded accessible finance and mortgage markets for average citizens. For Saudi citizens, the crisis of affordable housing relates to relatively low wages, youth unemployment, and exponentially rising housing costs. According to Reuters and property consultant firm Jones Lang LaSalle, the cost of a roughly 2,600 square-foot home in a major Saudi city is $186,000 to $226,000. This is 10 times the annual salary of a low-income family in the Gulf states. For example, Saudis who receive the Citizen’s Accounts stipend, a monthly payment from the government based on income level, make about $2,660 per month, which is the average monthly salary in the kingdom. The Citizen’s Accounts program is mandated year by year, and additional stipends to adjust for cost of living increases of about $260 per month were granted by King Salman bin Abdulaziz in January for all public sector employees for 2018. In Saudi Arabia, the housing crisis has been a central part of the Vision 2030 reform package. Access to affordable housing touches on many of the key concerns of a young and growing population in the Gulf states. One goal of Vision 2030 is for 60 percent of Saudis to own their own homes. There are currently 500,000 Saudis on a waiting list for the Saudi Real Estate Development Fund, which provides interest-free loans for state-constructed homes. The home is the physical representation of social and economic mobility, of readiness to marry and start a family. It is the center of social and family life in the Gulf states, and the inability to afford a home is a source of popular discontent. Governments know this and have protected these benefits, even as they have implemented new consumption taxes and reduced subsidies on fuel, water, and electricity. In a recent paper by the International Monetary Fund, Gulf Cooperation Council states have been advised to further reduce this kind of generous social spending, especially on free or subsidized housing, or at least develop better testing to target those families most in need, and limit excess government spending. But like most subsidies, providing free housing or deeply subsidizing home loans does not change the structural issues in the economy that limit ownership and mobility. It is not going to get cheaper to live in Saudi Arabia, or anywhere in the Gulf, anytime soon. Income and productivity will need to rise, and for the average citizen the only path to increasing income and purchasing power is better employment opportunities. How best to support low-income citizens while also promoting growth is a matter of intense debate in the academic and policy literature. One recommendation is cash transfers that can be taxed as income. Scholars have also questioned the feasibility of patterns of subsidies and transfers that do not address underlying inequalities in access to opportunity, in the availability of land, access to finance, discouraging monopolies and state-linked corrupt firms, or protection of the rights of property owners. In resource-rich economies, this tension persists between subsidies and transfer support and the ability to create an institutional framework that supports income growth, inclusion, and productivity. Home ownership embodies that tension of inclusion and mobility. And across the Arabian Peninsula, from Kuwait to Oman, this tension has been simmering for years. In Saudi Arabia, Vision 2030 clearly identifies housing as a government priority. King Salman and Crown Prince Mohammed bin Salman were not the first to identify the problem, yet they are most actively trying to solve it, albeit with traditional tools of authoritarian social policy. Under King Salman’s predecessor, King Abdullah bin Abdulaziz, numerous consultancies were engaged to address the Saudi housing crisis and they gathered public opinion data from citizens on how housing ranked among their key grievances. McKinsey’s pre-2014 work in this area in Saudi Arabia informed its larger research into a global affordable housing crisis. A 2014 study by Strategy& identified the demographic surge in housing demand in the GCC states. The report estimated that based on the demographics of the Gulf states, with the median age at 29, young people considering marriage and families would trigger a housing shortage of a million units by 2018. 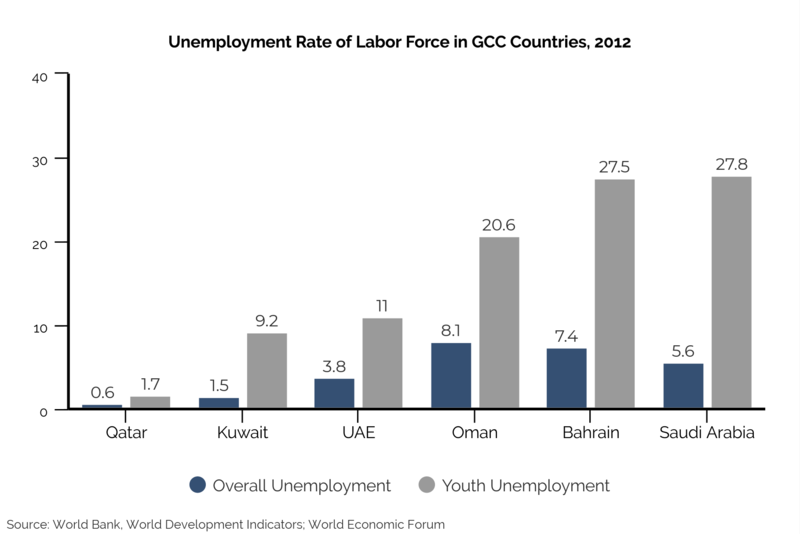 But more important than the youth bulge in the Gulf is the problem of how and where young people are working, and how they are included in plans for job growth and productivity. The bad news is that they have not been included, with high rates of unemployment blocking them from financial independence. The Strategy& report cites that, in 2012, the average residential home in Kuwait was priced at 30 times the average gross income for a person between the ages of 25 and 29. This compares to just 11 times the average younger person’s salary in Norway, and six times in the United States. Low salaries, largely in public sector jobs, have historically been amplified by the social welfare system that provided free health care, education, and very low electricity, fuel, and water costs. While cultural shifts and social media exposure have increased consumption patterns, the population surge and the cuts to subsidies have created an affordability crisis for many – though not all – Gulf citizens. One of the primary limitations to home ownership has been access to finance or mortgages and legal systems that make it difficult to transfer ownership. Here too, Saudi Arabia has recently begun making changes long suggested by advisors. After nearly three decades of attempts at formalizing a mortgage law and in response to pressure to increase government housing, in 2012 Saudi Arabia issued the Registered Real Estate Mortgage Law by decree, but failed to create a digital real estate register or bureau to track new mortgages. Many financial institutions continued to rely on the Ifragh structure to be in line with Islamic finance restrictions on earning interest. In the Ifragh structure, the title of the property is transferred to the lender until the loan is repaid. In addition to a preference against interest-based lending, Deloitte’s 2013 study of Saudi mortgage laws identified some key weaknesses in the expansion of credit to home buyers, particularly those programs that linked access to mortgages to salaries, which privileges public sector employees, and to the additional hurdles for first-time buyers who also make up the majority of a potential borrower market. Since May 2017, the Ifragh structure has not been allowed, yet building a mortgage market has proved difficult, not just in the creation of the practice of lending but in creating new institutions and then finding qualified borrowers. 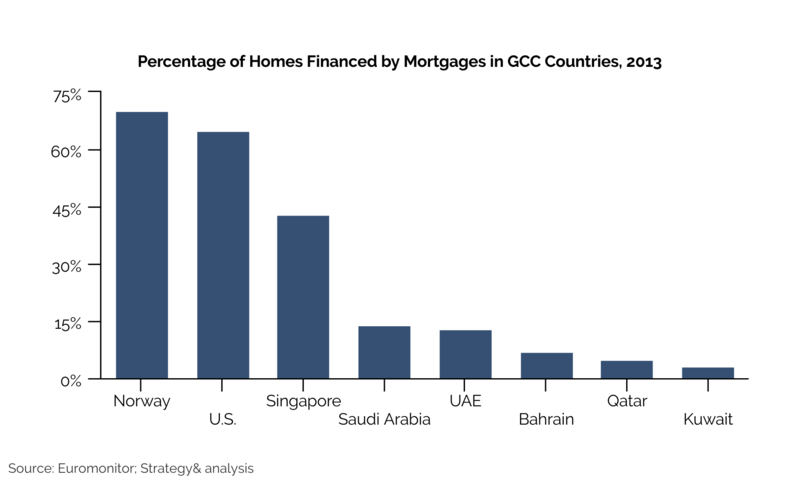 For most low- and average-income Saudis, savings and a down payment remain key obstacles to home ownership. There is some irony in the fact that real estate has been a driving force of Gulf economic prosperity, particularly for ruling families and their private holdings of development companies, yet providing housing is a key political weakness within state-society relations. Much of the contracting that is government led is in new megacities, infrastructure, or retail centers, rather than affordable housing. Contracting firms are under financial stress from delayed payments on government projects, while others, especially in Saudi Arabia, face outright nationalization or being absorbed by the state. The construction industry is under increasing pressure as years of downward spending weigh on the market. According to MEED, $63 billion in construction and transport projects were awarded in 2017, a sharp decline from the peak in 2013, when high oil prices drove government spending on infrastructure and real estate development worth $114.3 billion. Firms remain eager to secure lucrative state contracts, but the opportunity to work in a public-private partnership with state development agencies promises some risk in the housing sector, with few legal frameworks to protect investment. Likewise, the method of construction, utilizing prefabricated modular homes, is under pressure as labor markets and state priorities for job creation can impact the award of contracts. To accelerate the construction of new homes, and reduce costs, the Saudi government is investing in alternative systems like modular homes and commercial buildings. For firms that can provide a manufacturing setting in the kingdom and deliver housing units quickly, the magic combination of job creation and affordable housing seems attainable. For low- and middle-income Saudi families, however, the reform agenda needs to deliver on basic demands. The public policy objective has been obvious for a decade or more. Now is the moment when the very predictable housing shortage has arrived, along with a generation of young people who want to see their lives advancing. The anticipated construction boom of 2018 and 2019 will rely on a mix of state funding, public-private partnerships, and bank-financed projects. The bulk of construction in Saudi Arabia in 2018 will be led by the Public Investment Fund in major projects like Neom, Entertainment City, the Jeddah Waterfront, and tourism development in Medina. Projects like Neom are set to exit the planning phase and begin construction in late 2018 to early 2019. 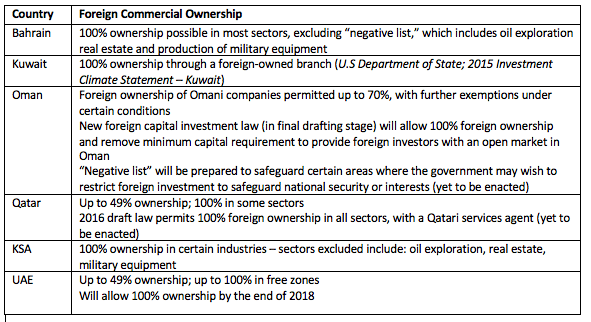 The risk is prioritizing the large prestige projects at the expense of providing affordable housing options (and more important than the subsidized home, the jobs to sustain ownership) for a generation of young Saudis.